Our World to Care For, Our Community to Protect. We're Here for YOU! ON "SELLING YOUR LAND" vs "LETTING THE COUNTY TAKE IT"
We have had a number of people wanting to donate property to the Land Trust over the past year because they have not been able to find a buyer for it. The County has the right to sell your property for taxes after five years of delinquency. However, putting property on the auction block costs the County money, and Modoc is a very poor county who cannot afford to do that as many times as they may be "allowed" to by law. So, every year in the Spring they put about 500 properties up for auction. That is only about 10% of the properties that are eligible for tax sale here. I think they only advertise these locally, but they go up on a website called "Bid4Assets.com", so I assume that website advertises them in some way. Of those that go up for auction, maybe 30% actually sell. A few sell for full tax value which is set as the "Reserve" price (as is required in the "First Round" of sales) but most wait for the "Second Round" of sales, where the County is allowed by law to accept whatever they think they can get (Bid4Assets will indicate this by showing there is "No Reserve" price set for the property). This might be as little as $500 per property (the cost the County has to pay to process the land through escrow). For all I know, they may even accept less. The properties that sell revert to the new owners with all debt cleared and a clear title (a GREAT deal! ), but those that do not sell stay with the original owner and the taxes remain past due and continue to add up each year (along with all the penalties) guaranteeing no one will buy it from you as the past taxes far exceed the actual value of the land. In the mean time, the POA is owed Association Dues (as required by the CC&Rs). This money is important to them because they have been doing maintenance on the roads and communally-owned properties here all this time, as they are required to by the CC&Rs. Right now those dues amount to $80 per year. If you fall behind on dues, the POA can threaten your credit rating. I don't know if the County can do that, but the POA can, and has. It is my understanding that they collected over $50,000 in past dues last year using this method. Also, it is my understanding that selling your property or having it go to tax sale, DOES NOT absolve you from paying past-due POA dues. People like to make the County and the POA out to be the villains in this scenario, but they are not. The POA and the County have a legal obligation to provide services to this area, whether we all pay our dues and taxes or not, and fulfilling those obligations costs money. The villain in this story is the developer who subdivided this land into so many (15,000) small lots, many of them of questionable development value, and created the service obligation for the POA and County. The developer is long gone, but they had a great marketing team and managed to sell every last property to a public thirsty for a "retreat" from the world. Now, nearly 50 years has past, and only about 3% of the properties have houses on them. Clearly dreams and reality have not collided here for everyone. However, there are still people out there with the "retreat" dream. In fact, many people happily own property here just to camp on occasionally. So, if you don't want your property any more, it is my recommendation you should put your propety up for sale at a very affordable price using free sites as much as possible. These include calpinesproperties.com and Craig's list. Zillow, eBay and Bid4Assets may also be viable for you, but I believe they either cost money or take a share of the sales price. You will need to check. You can also try to find a real estate agent, but I have been told that no real estate agent in the area will list raw land in Cal Pines because it takes too long to sell and costs them money to list and show during that time. If you find one that will, let me know! As you are waiting for your property to sell, protect your credit by continuing to pay the POA's dues, and protect your ability to sell your property by continuing to pay the County's taxes. One last thing, you may be tempted to use a quit-claim deed to transfer ownership of your property, but I would not recommend it. I have been told it does NOT provide enough protection to the buyer or the seller with regards to ownership unless you are transferring property to a spouse. Apparently a "land sale" contract is what you want for unimproved property. Best of all, is a grant deed that has title insurance attached. Again, I am not an attorney, and you should research this yourself before relying on this advice. I am only passing on what I have heard, but I heard it from what I consider a reliable source. The moral to the story is that even free land costs money and carries ongoing obligations. Before you buy or accept land that someone whats to give you (either as a gift or a bequest), research it to know what those obligations are. You may be stuck with them for a very long time. Our "Available California Pines Properties" website has been so popular that we have purchased the domain name to help protect the site and ensure we can continue to provide this listing service for free to all those who need it. It occurred to us that if we did not buy the domain name, someone else might. One of the many species of animals we are hoping to protect here in Cal Pines is the Townsend's Big-eared Bat. 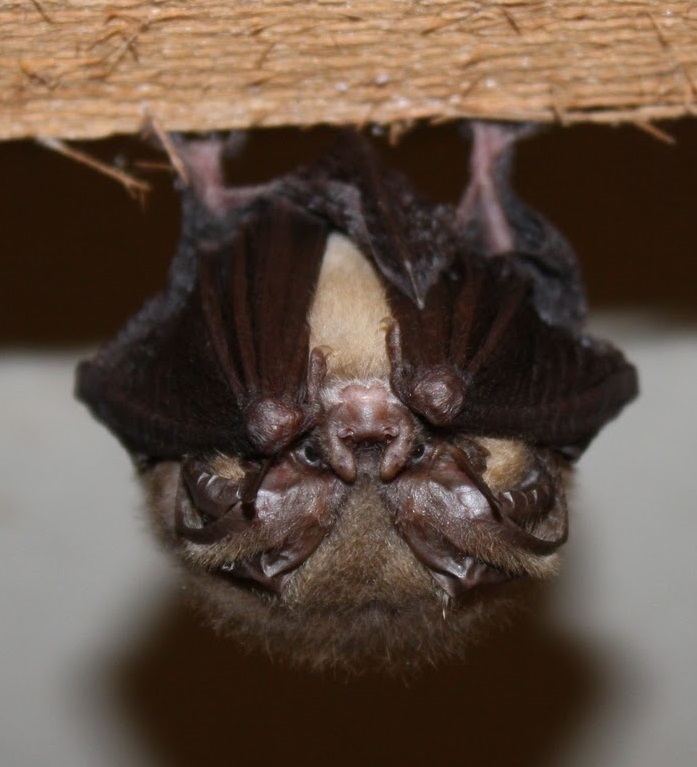 This bat is known for the unique habit of forming maternity roosts during breeding season. The maternity roosts are established in areas with ideal temperature and humidity, and are easily disturbed; this has made the species somewhat rare. 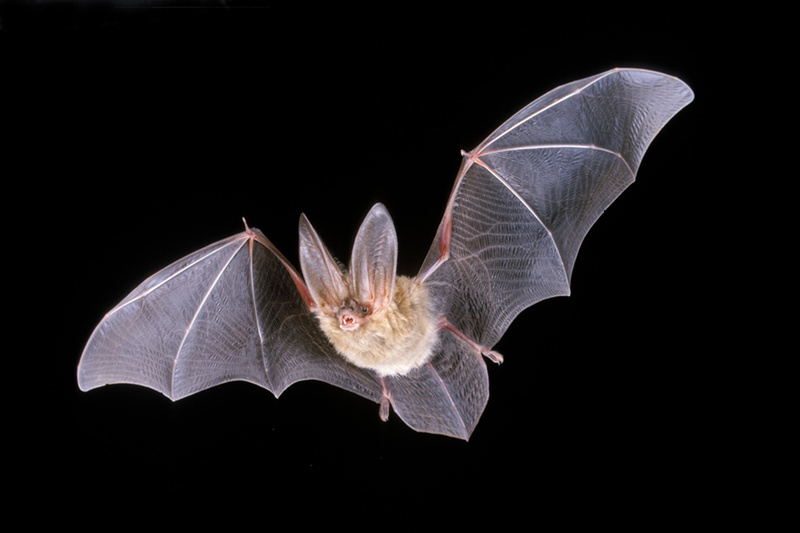 There are only a handful of Big-eared Bat colonies known in the state of California. One of the residents here was lucky enough to find a few roosting in the walk-in area under their deck. No maternity roosts have been found in Cal Pines to date however. Here are some fun facts on this wonderful flying mammal provided by the National Park Service. A Townsend's big-eared bat's average lifespan is 16 years; bats may live up to 30 years. Highly maneuverable flyer; capable of flying at slow hovering speeds. Large ears funnel sound into ear canal, and may also provide lift during flight and assist with temperature regulation. Townsend's big-eared bats are very sedentary, with movement by females during the nursing season rarely exceeding 15 km., and movement at other times usually being less than 50 km. When it's roosting or hibernating, Townsend's big-eared bat curls up its long ears so they look like ram's horns (see adjacent photo of one of our local bats). They do not tuck themselves into cracks and crevices like many bat species do, but prefer open roosting areas in large rooms with their fur erect to provide maximum insulation and with their ears coiled back. Townsend's big-eared bats, previously called lump-nosed bats, are a medium-sized bat with very long ears. Their fur is pale gray or brown above and buff colored on the underside. This bat's ears are enormous, reaching a length of 38 mm. When the ears are laid back they extend to the middle of its body. The face is marked by two large glandular lumps on either side of its nose. The Townsend's big-eared bat occurs throughout the west and is distributed from the southern portion of British Columbia south along the Pacific coast to central Mexico and east into the Great Plains, with isolated populations occurring in the central and eastern United States. Big-eared bats have been reported in a wide variety of habitat types ranging from sea level to 3,300 meters (10,826 feet). Habitat associations include: coniferous forests, mixed meso-phytic forests, deserts, native prairies, riparian communities, active agricultural areas, and coastal habitat types. Distribution is strongly correlated with the availability of caves and cave-like roosting habitat, with population centers occurring in areas dominated by exposed, cavity forming rock and/or historic mining districts. They prefer open roosting areas in large rooms and do not tuck themselves into cracks and crevices like many bat species do. Radio-tracking has shown that the bats forage up to 5 kilometers (about 3 miles) away to feed on moths and other insects, returning to the roost each morning. In contrast to other southwest bats, due to its relatively poor urine concentrating ability, it drinks water. Winter hibernation colonies are comprised of males and females and range in size from a few individuals to several hundred bats. If undisturbed, colonies will occupy the same site indefinitely. In the summer, the females form a nesting roost. Males are solitary during the maternity periods. The maternity colonies consist of one or more small clusters, which rarely exceed 100 bats. Females are alert and active in the maternity roosts and prefer dark places for their roosts. These colonies form between March and June (depending on climate), with pups born between May and July. Maternity colonies choose sites that have warm, stable temperatures for pup rearing. Female bats usually only have one young a year. The newborns range in weight from 2.1-2.7 grams. There is a strong maternal bond and the young bats squawk when the mother is away. The young bats, however, grow quickly, being able to fly within three weeks. After two months, many of the young bats have left the nursery roosts, with male bats leaving before female. In their first year, male bats are almost certainly incapable of breeding while female bats are able to reproduce at the age of four months. Historically, this species has declined due to direct killing by people and because of destruction or disturbance of roost sites. These animals are sensitive to light and movement so if they are disturbed during the day, they awake and their ears begin to move as they try to identify the intruder. If the disturbance occurs for more than a few seconds, the entire group takes flight and the roost may be abandoned. A study sponsored by the California Department of Fish and Game in the late 1980's documented a population decline of 40-60% in the past 30 years. Only about half of the maternity colonies known to exist in California prior to 1980 were active by 1991, resulting in an estimated 54% decline of adult females. Only three maternity colonies increased in size during the period, and all three are located in National Park areas (Point Reyes National Park, Lava Beds National Monument, and Pinnacles National Monument). Of the 23 roosts that are no longer available to bats, 9 (mostly buildings) have been demolished, 4 (all buildings) have burned, 4 (all buildings) have been renovated in such a way that bats were excluded, and 6 (including buildings, caves, mines, and a water diversion tunnel) have had the entrance closed. Consequently, for this species to exist, minimization of human disturbance is essential. In additional, it is essential that habitat be preserved. LAKE UNITS: If we can get the cooperation of the POA and the surrounding ranchers, we would like to help improve the quality of the bird habitat around Donovan Reservoir (known locally as "The Lake") and perhaps build an exercise circuit around the lake with observation and fishing platforms. We have submitted two grant funding requests to help with this project. One request was declined, and one is still outstanding. We will continue to search for other funding opportunities as well, but could really use some community support to help land these grants. HILL UNITS: We are looking to acquire property suitable for a Nature Center that can also serve as a community gathering spot in the Hill Units and as a Land Trust office. The Center would have a large BBQ pit and bon fire area, a signed "native plant" hiking path, information on the wildlife here, an indoor gathering area for group events, maps of the mountain, and other amenities that might be helpful to the community and its visitors. Ideally, the property would be accessible year-round, have an existing structure, a good well and access to power. Any ideas for a location? Want to help make this happen? HOW YOU CAN HELP: If any of this sounds like a good idea to you, please become a member of the Land Trust by clicking on the "Pay Now" button in the right column (you can find more information on the benefits of becoming a Sponsor by going to the "Becoming a Member or Program Sponsor" page noted above). We can really use your support! A show of community support (through membership) helps to land grant funds (and may help convince the POA and County to work with us). It also helps provide the necessary funding to make these improvements. We also plan to work on removing debris on the mountain this summer and could use volunteers for our work parties! What do you say? The California Pines Community Land Trust is a small organization, and its Board has concluded that while we can accept improved property donations, we cannot accept most raw land donations at this time due to the high cost of managing them. The Land Trust attended the Annual Meeting of the Property Owners Association Members, and had an opportunity to introduce ourselves and our work to the group. We would like to thank the Cal Pines Lodge for allowing us to hand out informational materials in the hotel lobby, and we are very pleased to welcome eight new Supporting Members that joined the Land Trust at the meeting. We look forward to working with you to help improve Cal Pines! In our continuing search for funds to improve California Pines, the Land Trust has submitted a $5,000 Grant request to Cornell Lab's Small Grant Program under the Land Trust Bird Conservation Initiative. If awarded, funds will be used to help develop a long-term conservation agreement for the Donovan Reservoir satisfactory to all stakeholders that includes parameters for water use and retention, livestock grazing, recreational boating and fishing, hiking and jogging trail alignment and design, habitat maintenance requirements, and easement requirements on private land. The agreement will be a first step toward securing building and maintenance funds for all of the above. Grant awards are expected to be decided by April 30th, and will require matching funds from the Land Trust. Do you want to see this project happen? JOIN THE LAND TRUST TODAY! Cornell Labs' Land Trust Bird Conservation Mission: To support land trusts and their partners in accomplishing bird conservation on private lands through acquisition/easements, habitat planning, outreach, and research. Enter Your Email to Get Our Latest News Automatically! Please see the "Becoming a Member or Program Sponsor" page for details on member benefits. BE ONE OF THE FIVE THOUSAND! If less than half the property owners in California Pines made the Land Trust their charity on SMILE AMAZON, and spent only $30 per month, the Land Trust would receive a $750 donation every month from Amazon.com! Don't let your money slip through your fingers. Have it cycle back to help the wildlife and natural systems here in California Pines. Choose the California Pines Community Land Trust as your charity on "Smile.Amazon.com". The California Pines Community Land Trust is a 501(c)(3) Nonprofit, and we have big plans for using our status to help make California Pines a better place to live, work and play. However, we need your help in getting off the ground. Here are a few ways you can contribute! CAL PINES LAND DONATIONS - Want to get out from under paying annual POA dues and Property Taxes? Or are you just tired of paying fees and taxes on land that you know you will not use? Consider donating the land to the California Pines Community Land Trust. You will get a tax write-off for the value of the land you donate, and your lot will be merged with others on the mountain to create recreation areas and wildlife preserves that you can visit in the future! Use the form located on the "Donating Land" page (see tab at top of this page) to let us know you may be interested in this program. VOLUNTEER WORK - The Trust will be organizing clean-up and trail-building crews, as well as fundraising events and we can really use your help! Just let us know what you might be interested in helping with via the Contact From on this page. Be sure to include any specialized skills or experience you have that might help us place you on the right team! MONETARY DONATIONS - We will have many start-up costs to cover early on, and we have plans to develop a Hill Unit Community Center to serve as our home base. If you can find it in your heart to sponsor our work, we can really use your contribution! Please use the Paypal "Donate" button above to send us your donation. All donations are tax deductible!